This diamond in the rough was polished to perfection by a creative architect, talented home owners and top-drawer suppliers. When you see the place you want to call home forever, it’s only natural to picture your life there. 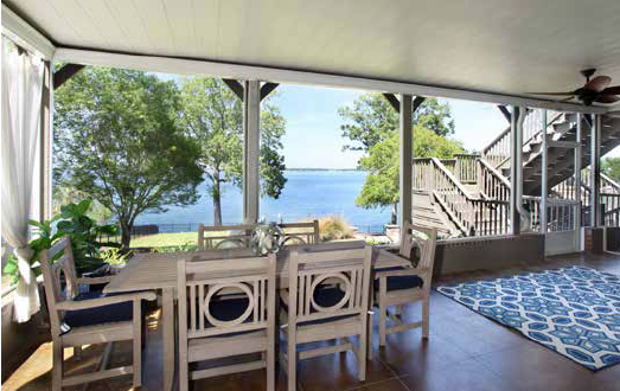 When Teresa and Charles found this lakefront gem, it was a diamond in the rough. The view was perfection; the house, not so much. The 1980s left behind a calling card of outdated décor and overgrown bushes, accented by a lovely wall of rotting latticework. This forever home needed a lot of work to become the stylish showplace it is today. The couple knew complex design changes would require a competent professional, so they set out to find help. Each person researched separately and the findings were presented to one another. Surprisingly, each one had a top name in mind. The same name: architect Michael Haigler, who won the selection process by both parties. They kept the area underneath and, by taking the top off and relocating part of the upstairs footprint, volume was restored, while allowing the downstairs closet and powder room to remain. “The new stairs now wrap around to allow entry into the front upstairs bedroom. A signature round window was centered over new double mahogany entry doors and new orbital chandeliers were added,” Michael said. Just to the right of the entrance, this key space was masked by a strong color and a useless focal point. Transformation into a classic library turned the pointless into a purposeful space, full of classics and modern tomes. The center of the room has two comfy chairs and their orientation is towards the water view available through the open doorway adjoining the den and rear glass wall facing the majesty of Lake Murray. “The existing room was a parlor with a fake fireplace and dark orange/red wallpaper. This room became a gentleman’s library with floor-to-ceiling custom book shelves, leather sitting chairs and French doors offering a lake view through the new den,” explained Michael. As you move into the main living area, the home’s single color palette is most visible. The gray tone on tone is very modern, but the paint color used throughout was almost not to be. “I must’ve had sixty samples of paint,” Teresa said. “And I was looking at these, and Michael was looking at all the samples I’d done in the dining room and the hallways and he suggested that we just do the one color everywhere.” It’s Repose Gray by Sherwin Williams and it’s the one the family loves. “Once we went with just the one color throughout, it made a huge difference,” she said. “The house looked fifty percent better than it already did.” This color falls in the realm of greige, which is a term made popular in recent years to discuss the world between beige and gray. Repose Gray is one of the most widely selected grays from this paint line and has a warm undertone that doesn’t go brown, blue or green. It’s simply the perfect neutral for updating any living space. Teresa and Charles enjoy the ability to change the décor as often as they like, with different accessories in seasonal colors. Colors brought into the scheme pop off the calming background. “I do like changing things, so I’ll change the pillows and other items pretty frequently,” she said. Reclaimed wood flooring gives this home a unique feel. Instead of the heavily polyurethaned, typical red oak narrow planks, the new material is old growth, white oak in wider planks. “It’s only been oiled, no poly, so it’s very soft on your feet,” Teresa added. The floor isn’t reflective and is low maintenance. The light fixtures are where you’ll find sparkle and shine. Most of these lights were sourced from Restoration Hardware. Complementary styles of faceted glass, spherical orbs and modernist wall sconces show the forward-thinking style that brought this home into its own. Teresa’s favorite room is the den. “It’s my favorite because I can see the most,” she said about the expansive views of big water. A center fireplace forms a natural division between the living area and a sitting area with floor to ceiling windows. “This is another one of my favorite places to read,” she shared. “You’re basically looking out at water and it’s a great view.” Close proximity to the kitchen for snacks and beverages is a plus, too. Before the renovation, a massive fireplace dominated the lake-facing wall. A Mexican tile sunroom lay behind it, with no connection to the kitchen, which was hidden behind a mass of cabinets. The dining room was fitted with new flooring, paint and décor, but the ceiling medallion was left intact. “I love it. It’s like a stamp from the old house,” Teresa smiled. Located behind the dining room is the office, which was originally accessed from the kitchen. Now, you find your way to this room through the formal dining room’s pocket doors. “We felt like it made more sense to put a door through the dining room, making it more private,” Michael said. “It gets you away from the hub-bub of the kitchen.” When necessary, Charles can close himself away from the rest of the world to focus on his work. Next door is the reworked kitchen. “Tall oak cabinets further darkened and blocked the views to the lake. Here, we decided to open up as many walls as we could, wrapping and expanding the den around a slimmer version of the fireplace, and creating a see-through bar between the kitchen and the den. All of the surfaces were lightened and modernized,” explained Michael when describing the challenges of making over this most important piece of the puzzle. Simple stock cabinetry couldn’t answer the homeowners’ needs, so the couple sought another professional in his field. “We particularly enjoyed working with Jim Balcom and Crown Point Cabinetry, in Claremont, New Hampshire who provided custom cabinets for the kitchen, bathrooms, and library,” Michael said. The couple flew up to New Hampshire for a face to face meeting before employing Crown Point Cabinetry. It was important to Charles that the materials in the home be authentic and not composites or imitations of real wood and stone. Leathered granite is used prominently and the multi-purpose beverage center allows them to prepare coffeehouse-quality drinks at the touch of a button. High end appliances include a microwave drawer, a serious expanded stove with side by side ovens and refrigerated drawers separate from the main refrigerator. Upstairs, the most impressive master suite is a study in functionality and imagination. “You feel like you’re in a tree house, because up here, all you see is trees and water and it’s wonderful,” Teresa said about the adapted space. The bed is centered on a natural wood wall that serves as a division between sleeping and relaxing and preparation for the day ahead. The dressing area has a bevy of cabinets to expertly cloak extensive wardrobe items. A huge master bath gave the couple plenty of space, but the original configuration wasted its potential. The new version has a massive, elongated octagonal shower with steam and plenty of natural light. The countertop heights are taller than usual to make daily routines more comfortable for the tall homeowners. The separated sinks and closet are a better use of resources than the first floor plan allowed. The rear of the home looks drastically different. From a new stairwell to the addition of livable area in what was previously crawl space, the ghost of latticework is gone forevermore. The lake views from this level are astounding. Creative storage allows lake toys to hide from sight and the perfect entertaining cove gives the family a place to relax out of the sun and away from the elements. A remarkable rainwater management system was created to keep everything as dry as possible in what was just a damp spot under the main deck. “It’s for retrofitting decks, to make them usable underneath,” Michael said. The basement level was all crawl space, but now is a full-fledgd suite with guest room, full bath, den with fireplace, and serious storage scene. A wall of cabinets line the hallway leading to the garage and allow you to stow away your purchases straight away. Michael’s brilliant solution to the ordinary garage entrance is a favorite for this family. “As in many houses, you drive into the garage and go up the garage stairs to enter the house. And in most cases that experience involves passing through garage storage, or the mud-room, or the laundry. In this case, I wanted to provide a more pleasant entrance experience, since this is where the homeowners enter on a regular basis. A new wall was built to create a downstairs foyer off the garage. Now, there is an entry with art, decor, family photos, and a foyer table to be more welcoming, where you can drop off your keys and get settled,” he said. A lakeside refuge, every room of this formerly plain and closed-off house has gained a purpose: a home fit for sharing with family and friends for years to come.